We have some brand new, very exciting details regarding the upcoming Creepshow TV series. Legendary visual effects artist and horror master Greg Nicotero has been tapped to mastermind the new show, which will closely resemble the original 1982 horror anthology, only it will be made for the small screen as opposed to the big screen this time around. One thing that will remain is Stephen King's involvement, as was revealed during New York Comic Con over the weekend. Greg Nicotero, who is known best to modern audiences for his work on The Walking Dead, took part in the Shudder panel at NYCC and dished the new details on Creepshow, including some of the writers who are going to be involved. 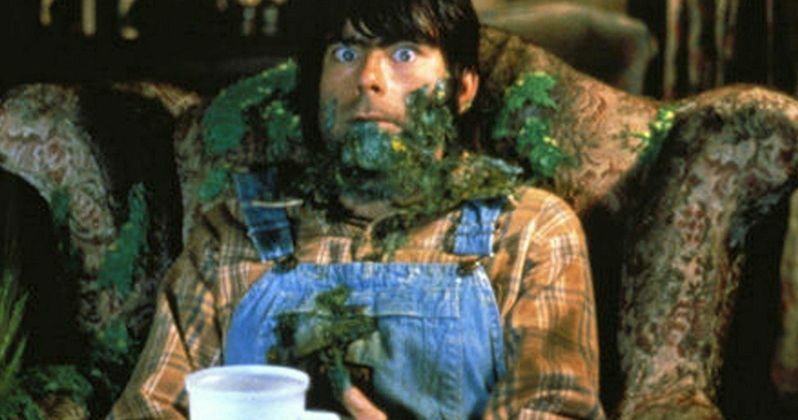 Stephen King wrote segments for the original movie and, to the assured delight of horror lovers, the legendary horror author will once again pen a story for this new series. It was also revealed that Joe Hill, King's son, will also be writing for the show, as well as Bubba Ho-Tep writer Joe R. Lansdale. That's a nice mix to start off with and there are going to be more writers announced in the future. Lansdale took to Twitter to confirm the news. "Creepshow. Glad to be a part of it." The first season of Creepshow will consist of six episodes. It seems likely that each writer will pen one episode. If that holds true, we should expect to hear three more names in the future. Stephen King is clearly one to be excited for, but Joe Hill is no slouch and hasn't just ridden on his father's coattails. His comic book Locke and Key is a prime example of excellent horror storytelling and he should fit in great with this format. And who knows what a guy like Lansdale can bring to the table. In other news, Greg Nicotero revealed that each episode of the series will vary in length and will be "as long as they need to be." That is unquestionably one of the benefits of doing something like this on a streaming service. It offers much more flexibility. Nicotero also explained that each episode will shift in tone, with some taking a more comedic approach and others being purely scary. This first batch of announced writers certainly speaks to that. Lastly, Nicotero revealed that the plan is to turn each of the episodes into digital comics for Shudder subscribers, which will ultimately be collected in a physical edition. Currently, Shudder, the horror-themed streaming service owned by AMC, hasn't revealed a premiere date for the series, nor is it clear when production will get underway. They did, however, reveal an amazing poster for NYCC, which started things off on a great note. We'll be sure to keep you posted as new details on the Creepshow series are made available. This was previously reported by Horror News Network.